How often do you install a clean version of a Windows operating system either for yourself or somebody else? Although a lot of users are sensible and make full backups of their system using either disk imaging software or something like the Windows 7 System image function, there is sometimes no option but to reinstall because it can’t be avoided. Hardware failures, viruses, or even computers with poor performing or highly abused operating systems are all reasons to have to wipe the old system and start again. Some users even install their operating system regularly to keep it clean and running at maximum performance. Whether you’re installing a new Windows by choice or by necessity, you will soon be pretty sick of wasting hours downloading all the hotfixes from Windows Update and continuously downloading patch after patch. Having just installed Windows 7 to see how many updates are available for the most popular version of Windows, it’s quite shocking to see it has 117 important updates ready to be downloaded! And that obviously doesn’t include recommended updates like the multitude of newer .NET Framework patches and subsequent updates after you install software like Internet Explorer 9 or 10 etc. One solution is to use a slipstreaming application like nLite to integrate hotfixes into the install disc, but even these become outdated every month after the latest round of hotfixes. If waiting for all the updates to install doesn’t appeal, an alternative is to have a program store and automatically install the updates for you from a USB stick or external hard drive. While it isn’t as quick as a slipstreamed disc, this method is an awful lot quicker than waiting for everything to be downloaded and installed from the internet, and can be left to it while you go and do something else. Here are 4 applications that can do exactly that, you can even run them on a currently installed Windows to bring it up to date. AutoPatcher has been around for several years and used to be distributed as a huge executable file that included all the update patches inside. After complaints from Microsoft in 2007, it was modified to download and distribute the patches direct from Microsoft’s own servers. AutoPatcher isn’t just a tool to apply Windows hotfixes though. Besides being able to install critical and recommended Windows updates, it can also do the same for Microsoft Office and install a number of extras such as the Office add-on pack, Adobe Flash and Reader, JAVA, the .NET Framework and Visual C++ patches. 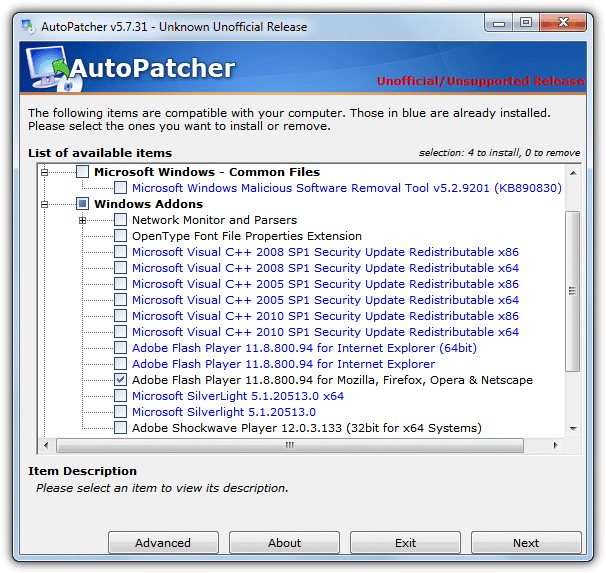 The package itself is split into 2 modules, the updater module (apup.exe) is where you select and download the chosen update packages, and the Patcher module (Autopatcher.exe) which you run to select the updates and addons to install on the unpatched system. Make sure to select and download the latest AutoPatcher program, engine and common module updates as the patch installer module gets downloaded in the engine update. Tick everything you want and click Next to start downloading. When all the required updates are downloaded, simply take the whole folder on a flash drive or hard drive to the target computer, or find the network drive, and run AutoPatcher.exe. After a few EULA screens and a file integrity check, the options screen will be displayed where the available updates and extras can be chosen for install. Critical or important patches will be ticked already, those in blue are currently installed on your system and don’t need selecting unless there is a specific need to do so. Click the button and then wait for AutoPatcher to install all the updates you have selected. To use AutoPatcher all you need on your operating system is the latest service pack to be able to install hotfix updates as it doesn’t support older Service Pack installs. SP3 for XP, SP2 for Vista and SP1 for Windows 7. Windows 8 isn’t supported yet although there is talk in their forum of implementing it in the future. You don’t need a clean install either, even the latest up to date Windows can still install any other add ons or extras that aren’t currently installed. This is an essential tool to save serious amounts of time and effort. 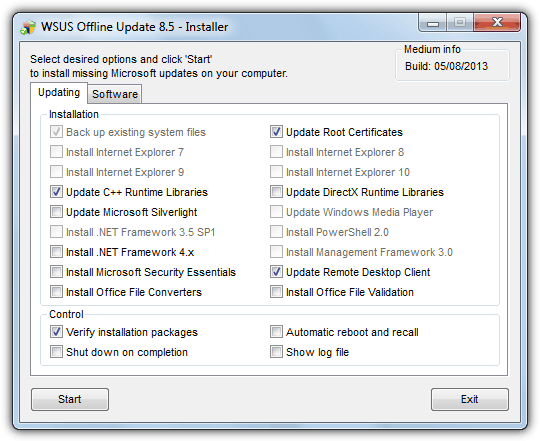 Formally called c’t Update, WSUS Offline Update is another tool that can update a number of Windows operating systems to the latest patches, and also keep nearly all versions of Microsoft Office up to date too. Although like Autopatcher in a lot of ways, there’s also some differences. WSUS Offline Update can update any Windows revision and doesn’t rely on it having the latest Service Pack installed. This can be a great help as lots of computers still don’t have XP Service Pack 3 or Vista Service Pack 2 installed which makes Autopatcher unusable until they’re updated. It can also download and install updates for several different languages so you’re not restricted to just English. After downloading, extracting and running the UpdateGenerator.exe, tick the boxes to select the operating system versions, Office versions and languages you require. Everything is split over 3 tabs called Windows, Office and Legacy products which includes Windows XP and Office 2003 as support for them ends in 2014. Some of the Options are very useful such as whether to download Service Packs, and whether to include Microsoft Security Essentials or Defender definitions in the package. The inclusion of C++ Runtimes and .NET Frameworks is also optional but leaving them included will be a BIG time saver. Something else WSUS Offline Update can do is write the update package to an ISO image which can be burned to CD/DVD/Blu-ray. Great for older systems or if you don’t have the right sized USB flash drive handy. Alternatively choose the USB medium option to copy the updates onto a USB flash or hard drive. Once you press Start, a Command Prompt window will open and begin downloading the files from Microsoft, the wait could be long if you’ve selected multiple options. Once completed, you can then take the disc or drive to another computer and run UpdateInstaller.exe to popup the installer window. Some options such as Internet Explorer versions, .NET Frameworks, PowerShell and Media Player will be greyed out depending on whether you have the option already installed or if operating system supports it. The “Automatic reboot and recall” option is a potential big time saver if you want the updates to be installed unattended. Be aware that the option temporarily disables UAC and also creates a temporary new user account called WSUSAdmin while updating. It will be deleted again after updating has completed.